Jackson -Conrad Will, James Hall, Jr.
William McHenry was born October 3, 1771. In the late 1790’s in Logan County KY he married Hannah Ruth Blackford. John, George, Henry H., William Jr., Martin G., Lucinda, Mary Jane and Elizabeth were the children born from this marriage. There is a reference of another son who may have been killed by Indians. Around 1810 William, his brother Daniel and their families settled in Illinois on a major trail between Vincenees IN and US Saline’s Illinois Territory. Territorial Governor Ninian Edwards appointed William Captain of the Militia. The 4th Regiment was formed and he and his men daily searched for possible Indian uprising. In KY, William had been a member of Wayne Anthony’s Cornstalk Militia and as Lieutenant in Price’s Battalion of Mounted volunteers he fought at the battle of Fallen Timbers. In the War of 1812 he again was in the service of his country. The Black Hawk War in 1932 found him as a Major in charge of a Spy Brigade in the Mounted Volunteers. William McHenry was mustered out, August 14, 1832 at nearly 61 years of age due to ill health. A petition, which was signed by William McHenry, was circulated in 1812 asking that Illinois be made a second-class territory. When statehood was confirmed in 1818 he was a delegate to the State Constitutional Convention and elected to the House of the First Session of the General Assembly. From then until his passing he served all but two sessions in the house or senate. 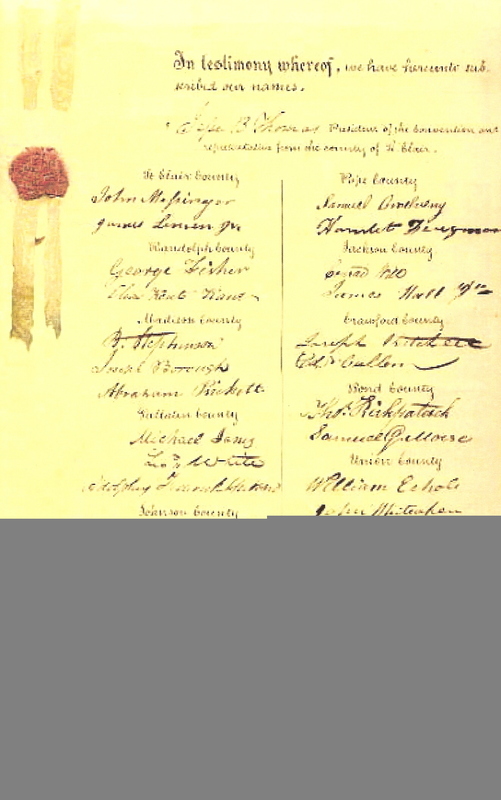 Willis Hargrave and William McHenry signed the Constitution of Illinois from White County.